Lately I've been finding it difficult to make myself go grocery shopping when I've got so many potential dishes to whip up based on what's already in the pantry. You know how that goes I'm sure. You see pasta on sale so you stock up "just in case," or you buy extra of anything without having a set purpose in your mind of how you'll use it. When it came to using the Test Kitchen ingredient last week of harissa olive oil, I listened to suggestions that others had given on Facebook but unfortunately could not manage any of those. 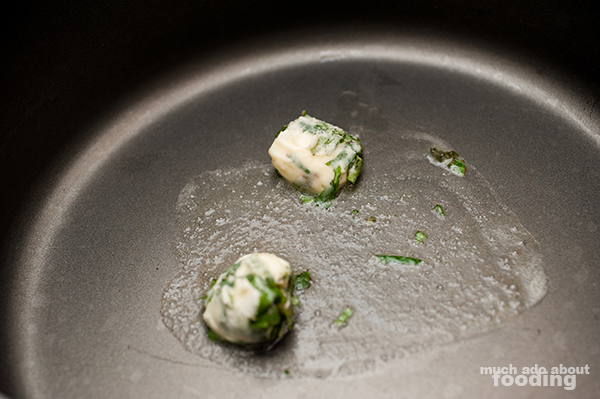 Then I thought about the sage butter I had made a while back with Duc's excess pineapple sage. The pasta boxes glared at me from the cupboard. It was time to mix and match some tastiness to make a great dinner. This recipe has a pleasantly slow burn that never breaches danger mode. 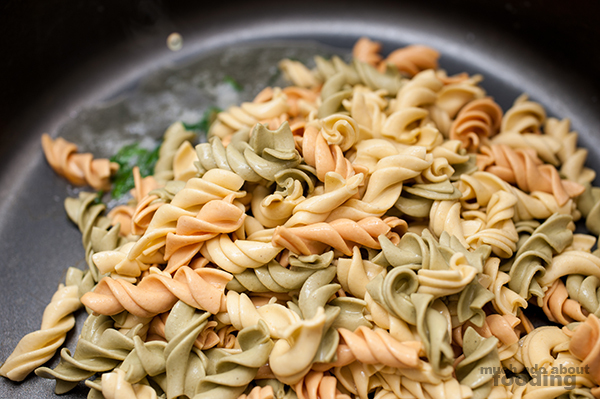 I had indicated above that the rotini should be dry. That was to make sure you had 6 oz. of it when it was dry - it will expand as you cook it. Cook in which method you prefer but not to full doneness as you will be cooking it again in the butter later. For shrimp, shell and de-vein. Butterfly along the backs. Slice onion. Into a large mixing bowl, add in shrimp, onion, harissa olive oil, pepper flakes, and 1/4 tsp garlic salt. Mix & marinade. In a large saucepan, drop in your butter on medium and let it melt to just the point when it starts to brown a little around the edges. 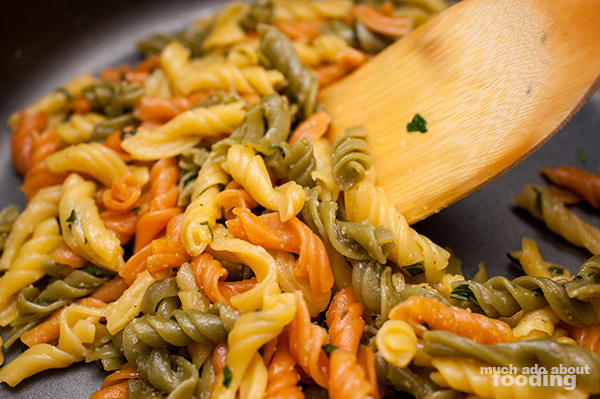 Add pasta and stir. If looking a little dry, add a bit of water as needed (depending on the dryness). Squeeze in half of the lemon juice you have and remaining garlic salt. 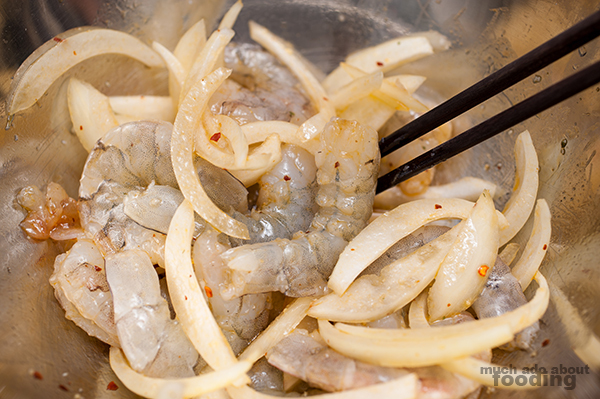 Squeeze remaining lemon juice into shrimp mixture. 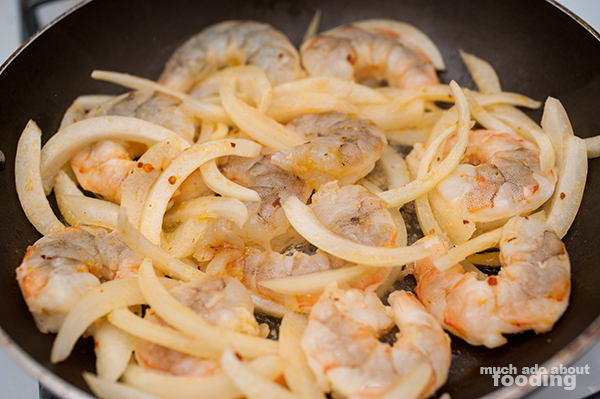 In a large skillet on medium high, cook the shrimp & onions. There should be enough olive oil to assist in the process. 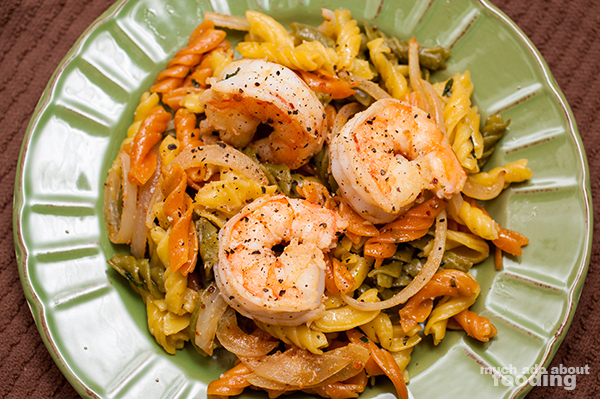 Remember that shrimp, when overcooked, is unpleasantly tough, so keep an eye on it. When you start to see the orange color creep up around the edges of the pan-touching side, you can flip it to the other side. Since the shrimp will be butterflied, you will be able to see when the remaining side finishes turning orange. Remove onions at about the same time too; you'll only want it to be slightly translucent so it retains its crunch and slightly spicy flavor. The pasta ought to be nice and coated now in the butter. 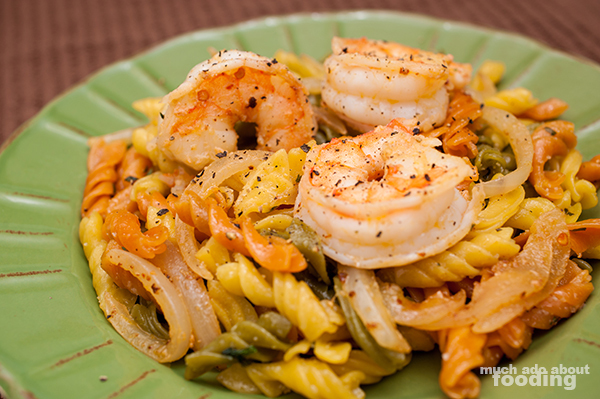 Plate it while nice and hot; top with shrimp & onions. Crack freshly ground black pepper over it all for a nice touch and enjoy! I feel like one day I'll run out of ingredients to use in Test Kitchen that aren't super exotic. However, that day probably isn't near because I'm still fairly a novice cook. 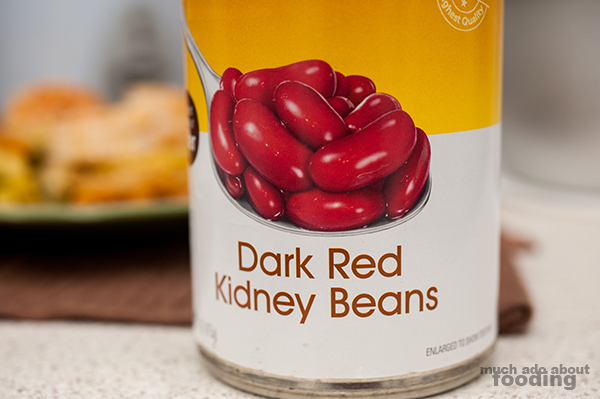 This week's is a can of dark red kidney beans because shoot, I just don't really eat beans. Let me know what you'd like to see me do with this when I put up the photo on Facebook!